I test fitted the starter and noticed that the pinion does not retract when it is released on the engine stand. What do I do with the wire that went to the "R" terminal on the original starter? Why does my starter make a whining or grinding noise? Why wont my starter crank when it's hot? Why do I keep cracking noses on my full size starters? What is the benefit of a high torque starter? Should I use a heat shield? Why does my starter seem to "run on" after the switch is released? How can I add a relay for my GM vehicle? It is normal for a gear reduction starter to hang in the ring gear when the engine is cranked, and yet does not start. Direct drive starters do not do this because they can rotate the small amount necessary to retract the pinion. Gear reduction starters do not retract in this situation because of the resistance of the gears. The tiny amount of rotation necessary to retract the pinion is amplified because of the gear ratio inside the starter, requiring four to five times the pressure to rotate the gear. All of this gear movement results in the pinion remaining in the ring gear until the engine fires. When the flywheel starts spinning faster than the starter gear, it will "throw" the drive back out. This could mean that your starter needs shimming. There are different methods of shimming a starter, depending on which direction the starter needs to be adjusted. If the starter to ring gear tolerance is too tight, you will need to shim the starter away from the ring gear. If the tolerance is loose, your ring gear may be worn or defective. Don't rule this out as a possible cause. You should have 0.020" clearance between the valley of the teeth of the flywheel and the tip of the tooth of the starter drive gear. This can be measured by using white out, crayon, or feeler gauge with the drive engaged into the flywheel. Why won't my starter crank when it's hot? This is common with full size starters. Excessive heat against the starter solenoid builds resistance in the coil. There are a few solutions for this problem. (1) You can install a starter relay (see question - Add a relay) if you do not have one already. (2) Install a heat shield on the solenoid. (3) Replace your full size starter with a gear reduction starter. The smaller body and variable clocking provides of most mini starters provides more clearance between the exhaust and the starter solenoid. Refer to the paragraph in this section, whining and grinding noise. These can all be factors. If you are not installing the starter with original equipment bolts, with knurling, the starter will become loose causing misalignment. Backfire while starting causes backlash which creates sudden excessive impact to the aluminum casting. If your engine is not tuned properly do not continue to crank your engine until your timing is set. The Hitachi and Denso style gear reduction starters have a solid mounting block and pinion that will withstand backfire better than the full size starter. Full size, direct drive, starters are not recommended for high compression engines. A physically smaller starter which is beneficial when space is an issue due to headers, deep sump oil pans, steering linkage, etc. Many units are rotatable or have solenoids that will sit further away from heat sources. The mini high torque units typically draw about half the amperage of stock starters. They have gear reduction which provides better cranking because they develop higher torque. This is necessary with higher compression engines. It is not necessary, but it is not a bad idea. This is a common complaint on Ford permanent magnet starters, although it can occur on any permanent magnet starter in the right conditions. This situation develops when the ignition terminal on the starter is "jumped" to the battery terminal on the starter and a remote solenoid is used. Permanent magnet starters can actually produce power if they are driven from an outside source (i.e. the starter will act like an alternator once the engine fires and starts spinning). The current produced in the starter for this second or so will flow from the starter's battery terminal to the starter's ignition terminal and hold the solenoid in. This will cause the one to two second delay in the solenoid release and make an irritating noise. 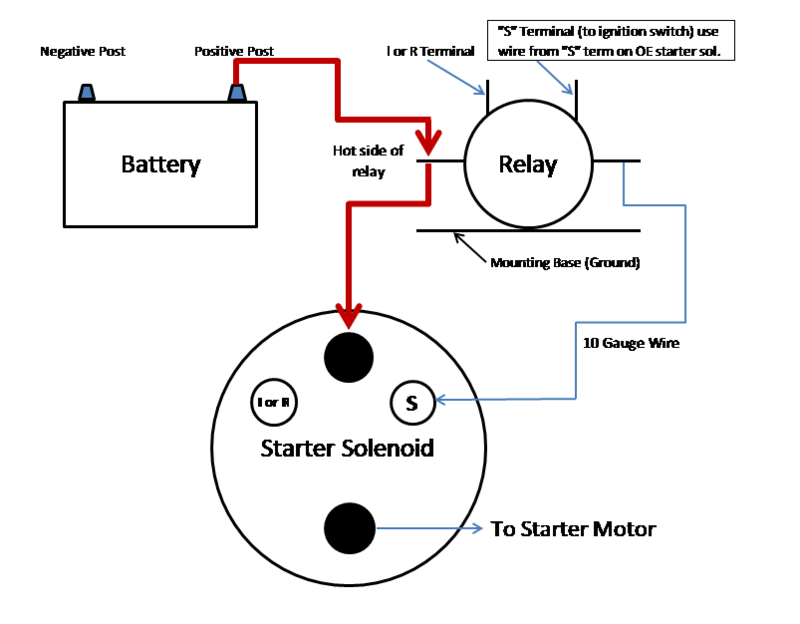 The solution is to wire the starter just like the diagram in our adding a relay question. This will ensure that the ignition switch terminal goes dead the instant the key is released. By following the schematic below, you can easily add a Ford style relay to your vehicle. Adding a relay that is wired this way will allow more current (amperage) to be provided to the starter solenoid. The higher amperage will produce a better reaction in the solenoid and better engagement for the contacts.